Waseda University started life as Tokyo Senmon Gakko (Tokyo College) on October 21, 1882. In the early years it was also commonly known as the Waseda Gakko (Waseda School) or Totsuka Gakko (Totsuka School), after the location of founder Shigenobu Okuma’s villa in the village of Waseda and the school’s location in Totsuka Village. 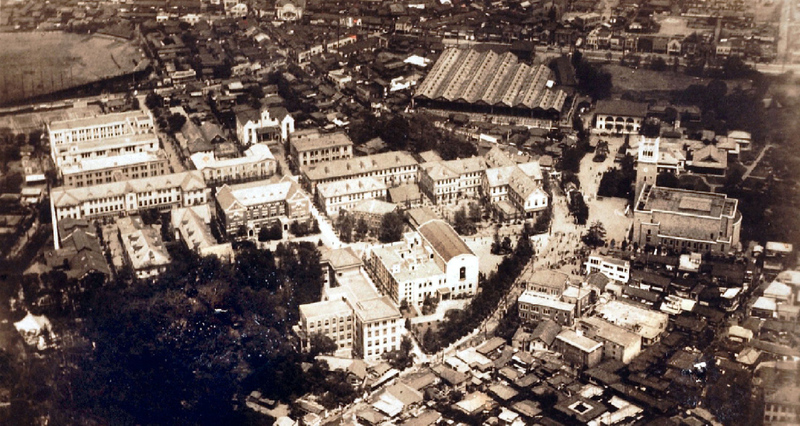 Around 1892, the vernacular name Waseda Gakko became prevalent, and the institution was formally renamed Waseda Daigaku (Waseda University) upon acquiring university designation in 1902. Tokyo Senmon Gakko (College) founded by Shigenobu Okuma with the Departments of Political Science, Law, English, and Physical Science. Graduate courses launched in the Department of Literature. Faculty members sent to Europe and America for the first time under the newly-established Foreign Travel Scholarships for faculty members. University Library building completed. Acquisition of university status. Renamed Waseda University, the institution comprised Schools of Political Science & Economics, Law, and Literature, seven senmon-bu (junior colleges), and a single graduate school. University status acquired under Senmon Gakko School Act. School of Commerce established. School for Chinese students established (closed in 1910). School of Science and Engineering established. Chartered under the newly enacted University Act comprising five undergraduate schools: Political Science and Economics, Law, Literature, Commerce, and Science and Engineering; Department of Commerce added as a professional training division. First Higher School (3-year course) newly launched. Death of Shigenobu Okuma, founder of the University. The campus overflows with students trying to get a look at the famous scientist when Albert Einstein comes to give a lecture at Waseda. New University Library and Student Hall completed. Tsubouchi Memorial Theatre Museum completed. Administration Building, Gymnasium, and Television Laboratory completed. Kagami Memorial Laboratory for Materials Science and Technology established. Science and Engineering Research Laboratory established. Institute of Social Sciences established. Imperial Memorial Hall, Okuma Kaikan faculty club, First Higher School Building, and Science and Engineering Research Laboratory Building destroyed by air-raids. Four-year college curricula established, with eleven schools, in accordance with the new education law. Waseda Senior High School started as an affiliated school. Graduate Schools (master’s degree programs) under the new educational program established, with six Schools. Two new graduate school buildings, one for Humanities and Social Sciences and the other for Science and Engineering, completed. Graduate Schools (doctoral degree programs) established. Waseda has turned out many politicians including several prime ministers since Tanzan Ishibashi, the first Waseda alumnus to be elected P.M. 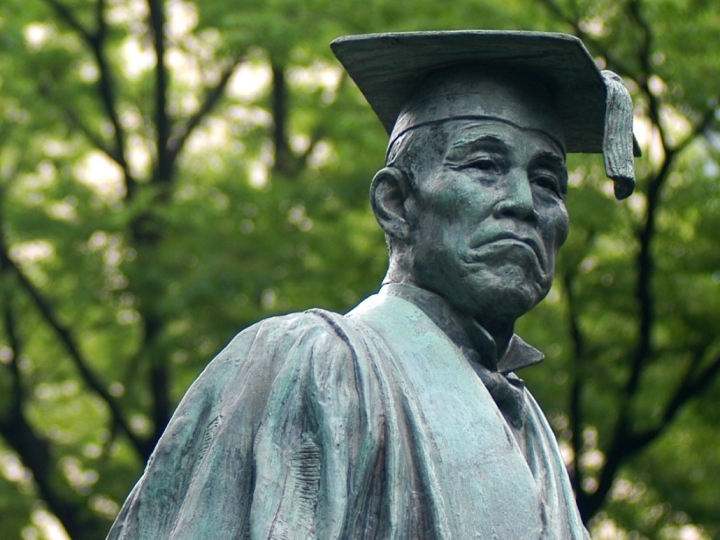 Together with Tanzan Ishibashi, Indian Prime Minister Jawaharlal Nehru is the first recipient of an honorary doctorate from Waseda. Advanced Teacher’s Training Course established. Institute of Comparative Law established. Institute of Language Teaching established. Robert Kennedy attends a student debate in the Okuma Auditorium. On his return to the United States he published an account of his travels “Just Friends and Brave Enemies”, donating the royalties to Waseda to create the Robert Kennedy Scholarship. School of Social Sciences (Evening Division only) established. Evening Division of the School of Science and Engineering abolished. Evening Divisions of the Schools of Political Science and Economics, Law, and Commerce abolished. Institute for Research in Business Administration established. Institute for Research in Contemporary Political & Economic Affairs established. Herbert von Karajan receives an honorary doctorate. In commemoration of his visit, the longtime resident counductor of the Berlin Philharmonic conducts the Waseda Symphony Orchestra. Waseda Honjo Senior High School started as an affiliated school. First centennial anniversary of the founding celebrated. School of Human Sciences established. Advanced Research Center for Human Sciences established. Center for Japanese Language established. Graduate School of Education established. Center for Scholarly Information established. Graduate School of Human Sciences established. Advanced Research Center for Science and Engineering established. Bill Clinton gives a lecture at the Okuma Auditorium followed by a friendly question and answer session with students. Graduate School of Social Sciences founded. Nelson Mandela is awarded an honorary doctorate and speaks passionately about democracy and peace in his recipient’s address. Media Network Center established to allow integration of Center for Informatics and other units working on information systems. Institute of Asia-Pacific Studies established as successor to the former Institute of Social Science and the Systems Science Institute. Graduate School of Asia-Pacific Studies established. Global Information and Telecommunication Institute established. Institute for Advanced Studies in Education established. 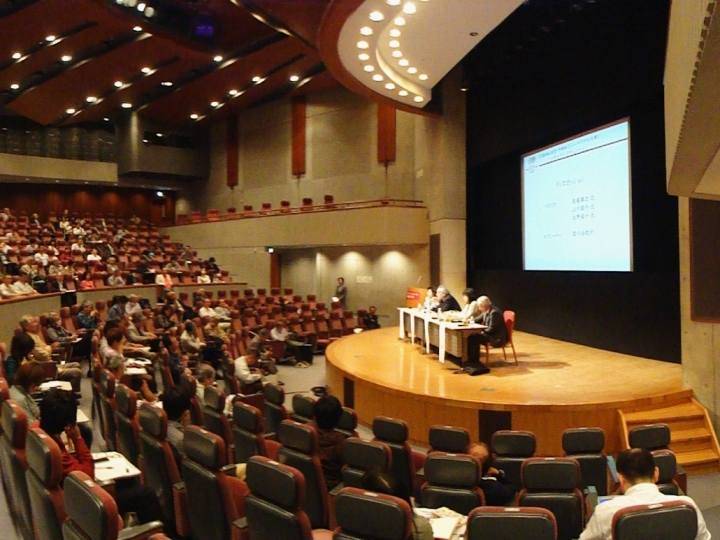 In the first official visit to Japan by a Chinese head of state, President Jiang Zemin gives a lecture at the Okuma Auditorium. Graduate School of Global Information and Telecommunication Studies established. Kyushu Laboratory, Advanced Research Institute for Science and Engineering established. 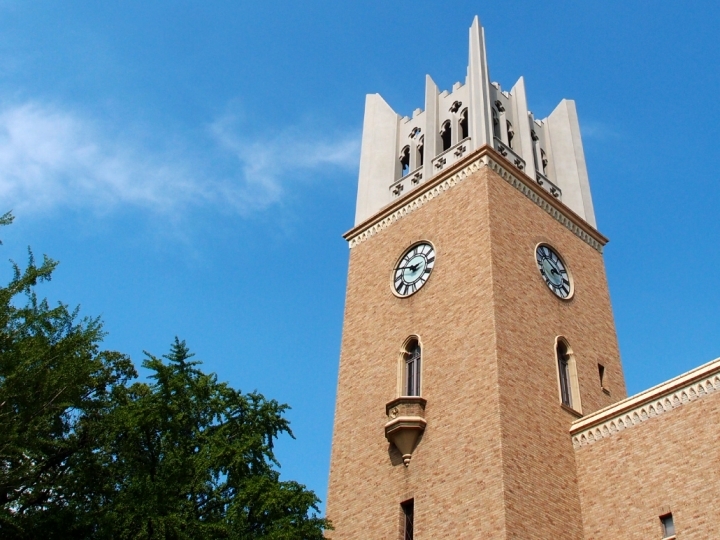 Graduate School of Japanese Applied Linguistics established. Art and Architecture School replaced College of Technology. Student Union Building (Toyama Campus) completed. Research and Development Center established. Hirayama Ikuo Memorial Volunteer Center established. Gloria Macapagal-Arroyo becomes the third Philippines President to receive an honorary doctorate. School of Sport Sciences established. Graduate School of Information, Production and Systems established. Okuma School of Public Management, Graduate School of Information, Production and Systems established. Graduate School of Asia-Pacific Studies (MOT) Established. e-school within School of Human Sciences established. School of International Liberal Studies established. Department of Global Political Economy established within the Faculty of Political Science and Economics. Graduate School of Finance, Accounting and Law established. President of Academia Sinica and Nobel Prize Laureate in chemistry, Yuan Tseh Lee receives an honorary doctorate in recognition of great contributions to humankind as a scientist. Graduate School of Accountancy established. Chairman and Chief Software Architect of Microsoft Corp. William Henry “Bill” Gates III receives an honorary doctorate. Gates gives a memorable speech with a message, “I look forward to the contributions that today’s university students will make to the world”. Graduate School of Sport Sciences established. Wangari Muta Maathai, the Nobel laureate for Peace receives an honorary doctorate in recognition of her civilian efforts in achieving peace and environmental sustainability, as represented by the Green Belt Movement. Schools of Letters, Arts and Sciences I and II were reorganized into School of Culture, Media and Society and School of Humanities and Social Sciences. School of Science and Engineering was reorganized into School of Fundamental Science and Engineering, School of Creative Science and Engineering, and School of Advanced Science and Engineering. Graduate School of Science and Engineering was reorganized into Graduate School of Creative Science and Engineering, Graduate School of Advanced Science and Engineering, and Graduate School of Environment and Energy Engineering. Henry A. receives an honorary doctorate in recognition of his contribution to the world peace. He emphasized the importance of international cooperation to students in his recipient’s address. Graduate School of Teacher Education established. The Tokyo Women’s Medical University-Waseda University Joint Institution for Advanced Biomedical Sciences (TWIns) established. National Chairman of China Hu Jintao visits Waseda University for speech on future-oriented amity to next term’s Japanese and Chinese youth. 100th anniversary of Faculty of Science and Engineering. US-Japan Research Institute (USJI) established. Waseda Setsyryo Junior High School, High School opens. Waseda BioScience Research Institute in Singapore (WABIOS) established. Special lecture by Kim Young-Sam, former President of the Republic of Korea. George W. Bush, 43rd President of the United States of America, gives special talk. Cooperative Major in Advanced Biomedical Sciences (with Tokyo Woman’s Medical Universit) opens. Cooperative Major in Nuclear Energy (with Tokyo City University) opens. Cooperative Major in Advanced Health Science (with Tokyo University of Agriculture and Technology) opens. Waseda Saga Junior High School, High School opens. Secretary-General of the United Nations Ban Ki-moon visits Waseda University for speech on “Peace and Disarmament” and dialogue with students. Office for Aiding Reconstruction from the Great East Japan Earthquake established. Center for Research on Reconstruction from the Great East Japan Earthquake established.